Publication : July 3rd 2012 by St. Martin's Press. With time running out to stop the nuclear destruction of Tel Aviv, Dewey Andreas must defeat his most fearsome opponent yet. Off a quiet street in Brooklyn, New York, Israeli Special Forces commander Kohl Meir is captured by operatives of the Iranian secret service, who smuggle Meir back to Iran, where he is imprisoned, tortured, and prepared for a show trial. What they don’t know is that Meir was in New York to recruit Dewey Andreas for a secret operation. Meir had been tipped off that Iran had finally succeeded in building their first nuclear weapon, one they were planning to use to attack Israel. His source was a high-level Iranian government official and his proof was a photo of the bomb itself. 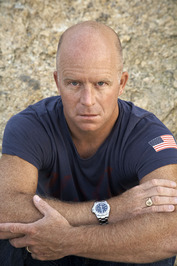 Dewey Andreas, a former Army Ranger and Delta, owes his life to Meir and his team of Israeli commandos. Now, to repay his debt, Dewey has to attempt the impossible ---to both rescue Meir from one of the world’s most secure prisons and to find and eliminate Iran’s nuclear bomb before it’s deployed---all without the help or sanction of Israel or America (at the near certain risk of detection by Iran). Unfortunately, Dewey’s first moves have caught the attention of Abu Paria, the brutal and brilliant head of VEVAK, the Iranian secret service. Now Dewey has to face off against, outwit, and outfight an opponent with equal cunning, skill, and determination, with the fate of millions hanging in the balance. 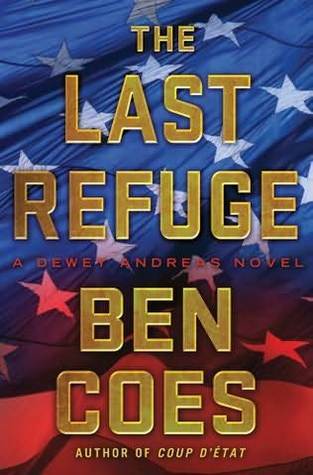 If you've read my review of The Last Refuge by Ben Coes, you'll know that I loved it! If you haven't, you can check it out here. Giveaway is US and Canada Only. The author/publisher is responsible to ensure that the winner gets the book. Winner has 36 hours to respond with his/her address or a new one will be picked. Giveaway ends on July 1st, 2012. BEN COES worked at the White House under President Ronald Reagan and was a White House appointed speechwriter at the height of the Gulf War. He was campaign manager of Mitt Romney's victorious run for Governor of Massachusetts and was a Fellow at Harvard University's John F. Kennedy School of Government. Ben lives in the Boston area with his family. That'd be The Jason Bourne films. I haven't read the books yet but hopefully I will some day. I like Black Sunday the old Thomas Harris book and the film with Bruce Dern. Hi! I'm following your blog now and it looks GREAT! OK, it has to be silence of the lamb, that was one scary movie. I absolutely love the Karin Slaughter series. I have read the 2 previous books in Ben Coes series and if you haven't read them, do it now. They were awesome! I loved your review of this book. It is one I am anxiously awaiting and has been on my TBR pile for some time now. Best of luck with the giveaway. My favorite is Silence of the Lambs.